Okay, who are the nearly 300 people who typed the keywords “organic crock pot” in to Google and found our blog? Thank you for reading, but any crock pot recipe can be organic: just use organic ingredients. So to keep the hits coming to our blog I appropriately titled this weeks Hunk Of Meat Monday recipe. 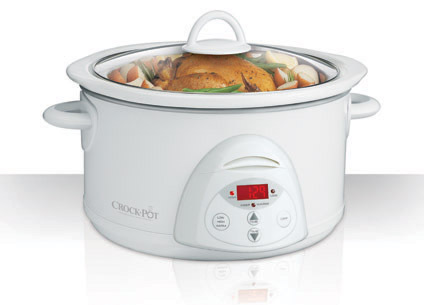 Cooking chicken in the crock pot is super easy and anyone can do it (even my friend Nicole). If you want to make the recipe organic, use organic ingredients. If you live by us make sure to stop by and pick up some chicken. Rub chicken with herbs, salt and pepper. 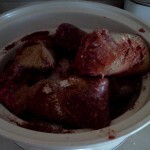 Place in crock pot and pour wine over chicken. Cook on low for 6-8 hours. Make sure the chicken’s juices run clear and internal temp is 175. This a very basic recipe. You can adjust flavor however you wish. 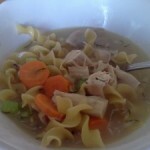 I also like to make this chicken then use it in chicken salad or in soups. If you wish, you could add vegetables such as carrots and onions to the crock pot. Another time saver: place the chicken in the crock pot frozen. Adjust the time, but it still comes out juicy. 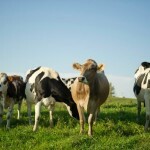 Enjoy with rice, steamed green beans and a glass of Organic Valley milk. 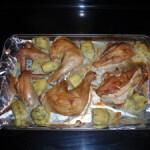 I do chicken in the crock pot all the time, it’s my favorite way to cook a whole chicken, so easy. I’ve done it with wine, I’m going to give this recipe a try next time I’m cooking a whole chicken. Oops, I meant I’ve never done it with wine. Sorry!